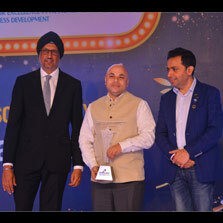 With great pleasure, we announce that on 22nd October 2018, at a dazzling ceremony at Hotel Lalit, Zee Learn Ltd. was awarded the prestigious award – Franchisor of the Year 2018 by Franchise India. We are thrilled to share that Zee Learn Ltd has been recognized as the top franchisor not only in education but across all 28 categories of franchising. Years of hard work and dedication have been rewarded with Zee Learn being awarded the overall winner for the first time. It is indeed a proud moment for the Zee Learn family.